Apple Taffy (Candy Rush) High Nicotine E-Liquid by Pod-Salt. 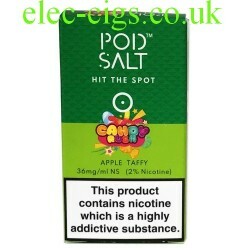 Thanks to 'Candy Rush' we have one of their most popular flavours given the 'Pod-Salt' treatment. The magical taste of the real Toffee Apple and max nic hit; what more do you want? 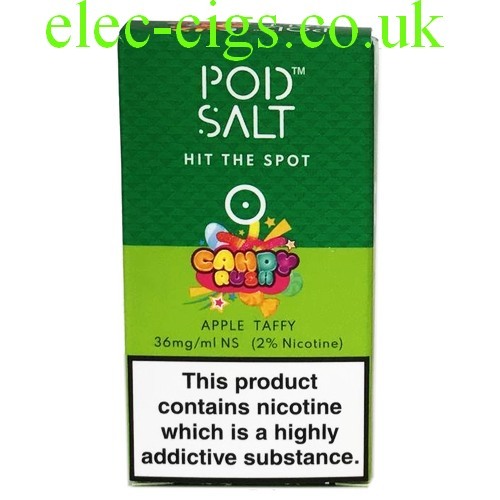 Apple Taffy (Candy Rush) High Nicotine E-Liquid by Pod-Salt has a formula which makes it the e-liquid with the highest legal content throughout the whole of the E.U. and, because of the salt formulation it has a 36mg/ml Nicotinyl Salicylate (3.6%) which is equivalent to 20mg Nicotine. Even by adding nicotine to a Zero nicotine e-liquid you cannot get near the nicotine hit of this e-liquid. It is in a 10 ml bottle and has huge discounts for purchasing 5,10 or 20 units. Please just buy one initially to make sure it suits you as returns cannot be accepted. Apple Taffy (Candy Rush) High Nicotine E-Liquid by Pod-Salt: The comments with reference to the flavour are a personal interpretation and the claims and figures regarding the nicotine are correct at time of publishing: This product contains nicotine which is a highly addictive substance.